Some might think the words weight loss and potatoes don’t go hand in hand. But, it is important to remember that we need a moderate amount of healthy carbohydrates to keep weight loss going. A sweet potato at dinnertime can help to balance the meal, add nutrition, and keep you feeling full and satisfied. What’s amazing about sweet potatoes is that they have high fiber content. Technically, you can subtract the grams of fiber from the total amount of carbohydrates to get an idea of the net grams of carbohydrates that we use for energy. We can not process fiber for energy, meaning, we can not turn fiber into calories. When compared to russet white potatoes, sweet potatoes can sometimes contain double the amount of fiber. Vitamin A: 1 cup of a cooked sweet potato can get you all the vitamin A you need in the day, times 4! Vitamin C and Manganese: An excellent source. Glycemic Index of about 50: This means sweet potatoes are a good choice for those trying to maintain more even blood glucose levels. Maintaining balanced blood glucose will help to keep hunger levels calm and energy high. 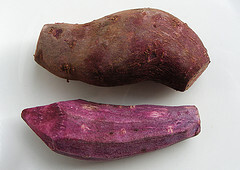 Full of antioxidants: Sporamins, anthocyanins, and carotenoids are just some of the names of the main antioxidants.Don’t forget to eat the skin since more of the fiber and antioxidant benefits are found in and around the skin.Purple sweet potatoes contain even more powerful antioxidants. Increased adiponectin in the body: Some research has shown that sweet potatoes can help to increase the hormone, adiponectin, which will help to mobilize fat in the body. It is a better choice to go ahead and eat the nutrient-packed sweet potato then to worry about the carbohydrate content and miss out on all the health benefits. 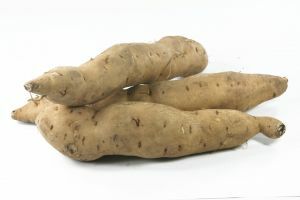 When selecting at the store, sweet potatoes and yams (in America) are the same vegetable at most every grocery store. When they originated, sweet potatoes were different from yams, but now we use the terms interchangeably when referring to the likely orange root vegetable. Microwave for 2-5 minutes, and then cook in an oven or toaster oven for about 10 minutes on 350-400 F.
Slice into large cubes and roast with 2 Tbsp. olive oil for about 35 minutes at 400 F.
Make your own sweet potato fries. Do you eat sweet potatoes? If so, how do you enjoy them? Investors read that sweet potatoes when eaten greater than 3000mcg can lead to fatty liver disease, blindness & other nasty health issues. What is the truth! So how many grams of sweet potatoes is it safe to eat in a week? Spray with a cooking oil, olive oil, and roast in the air fryer 12 minutes at 380..I flip them once to get the ones under the other ones..add a tad of butter some cinnamon. not sure how old this post is, but there is a big flaw in it. only boiled sweet potatoes have a low GI value of ~45-50. baked sweet potatoes are super high, in the 90’s. I eat only the skin of yams and sweet potatoes. How many carbs are in the skin only? I’ve researched this and cannot find the answer.can you help? Yes, nutritionally they are similar. I enjoy eating sweet potato and recently found out it js good for dieting. I love sweet potatoes so much, I’ve built an entire specialty food business on them! So far, we have five fat-free roasted sweet potato dips, with a pancake mix coming out soon. I love them because of their amazing nutritional benefits, their gorgeous color, and delicious, naturally sweet flavor. Three of my dips have only 250 calories — in the whole 12-oz. jar!! With the addition of basic, clean, whole foods, you can really make wonderful sweet potato dishes. I love sweet potatoes. They are one of the only carb/starch foods I can just eat. Regular potatoes I need to add something to, butter or sour cream.. which usually ruins it calorie/fat wise. For ease you can get large bags of sweet potato fries at Costco. I didnt know purple had more antioxidants. I thought they were just different color.. time to find some! The 1 cup value above (180 Calories) is with skin (according the USDA nutrient database). That sounds nice… roasted Fennel bulbs is something I’ve never tried. Is it really possible to eat them raw? They’re sweet – but not THAT sweet? I just cut regular potatoes into cubes and let them sit in a lactobacillus bath for a day or two to get the glycemic index down. I generally am careful to eat a small or medium sized sweet potato now and then. I can get the same amount of beta carotene from carrots for far fewer calories-therefore I eat carrots virtually everyday- but not sweet potatoes. I once bought a sweet potato that weighed 2 pounds to make a souffle for Christmas- at 26 calories an ounce, that sweet potato, before any toppings, has 832 calories. I try to eat one that is about 5 or 6 ounces, or 130 or 150 calories. Sweet potato souffle is also generally even higher in calories at the same volume. Some has 270 calories per half cup. A non premium ice cream often has just half the calories in the same half cup. Nothing wrong with sweet potatoes, but watch the portions. Are you including the skin in your calorie count? Because I love the skin and understand that’s where the most nutrition often lurks. I rarely eat sweet potatoes because, even after subtracting the fiber, they’re still what I consider a higher carbohydrate food. Being very sensitive to the carbohydrate I eat, I keep them to a minimum. I’ve been following the Zone diet for many years and it’s helped me learn how to combine carbohydrates to achieve optimal blood sugar control. With the Zone diet I’m burning fat to produce my energy (burning fat to produce ATP vs burning carbohydrate to produce ATP), I’m not particularly looking for the energy production capabilities of denser carbohydrate foods. I like to get a variety of color in my veggies for the polyphenols and antioxidants they contain so I’ll add a small sweet potato to other veggie dishes now and then. Nothing is totally off limits as long as I choose portions wisely. One of my favorite combinations is a roasted veggie dish of a couple fennel bulbs, onion, a little bit of carrot, lots of celery and one very small sweet potato, all tossed with some olive oil and a little S&P. I did not realize that the sweet potato had more fiber than russet white potatoes…Every once I will bake several sweet potatoes at the start of the week then heat one or two up with a meal. I eat them raw. They are the perfect snack. Being crunchy, they satisfy the need to chew. I always eat the Vardeman sweet potato which has orange flesh and is grown here in Mississippi. I eat them on occasion, but I don’t eat them all the time. I prefer them roasted with a bit of olive oil, salt, and pepper or cut into fries and baked with salt and pepper. They’re also good tossed with garlic and chili powder…I do prefer them to regular russet potatoes, that’s for sure.